Oh my, it’s that time of year when an unexpected visitor might just stop by, isn’t it? Last night my daughter asked if her friend could stay for dinner, and I was more than happy to oblige. I’d planned tacos for our family, but I knew her friend doesn’t eat red meat and had Mexican food the night before anyway. I had to think of something else. I’m in the midst of planning a Christmas dinner with friends, so my fridge was full of foods for another meal. I had to find something quick, without red meat, suitable for a chilly winter night. How I wished I could just open a can of tomato soup and serve it with salad and grilled cheese sandwiches! I have lots of canned tomatoes in my pantry, but none of the condensed tomato soup that I rely on. So I took a shot at making my own homemade tomato soup. It was a delicious surprise! I’ll never go back to condensed tomato soup again. I chopped half of a large sweet onion roughly. I heated a tablespoon of olive oil in a soup pot over medium heat, and added the onion. I cooked the onion until translucent, stirring occasionally. I seasoned the onions with a little salt and pepper to taste. While the onions cooked, I minced two cloves of garlic. I added the garlic to the pot and cooked 2 minutes more. Next I added two 28 oz. cans of San Marzano whole, peeled tomatoes. I turned up the heat a bit and broke up the tomatoes with a wooden spoon. Then I added about 2/3 cup chicken stock, though I think water would have been fine. I brought the soup up to the boiling point, and then turned down the heat to let it simmer for another 10 minutes or so. When I was sure the onions were cooked completely, I turned off the heat and transferred the soup in 3 batches to my blender. I transferred each batch to another container until all of the soup was blended smooth, then added all of it back to the soup pot. I kept the soup warm on the stove while I made the salad and sandwiches. At the last minute, I added about ½ cup of heavy cream that I had leftover from another recipe and a little milk so that it was the creamy consistency I love. As a finishing touch, I added a small spoon of basil pesto in the soup. The green swirl through the red soup added just the right holiday note to the meal. In the future, I may try this topped with cheese, sour cream, chopped basil, or garlic croutons also. 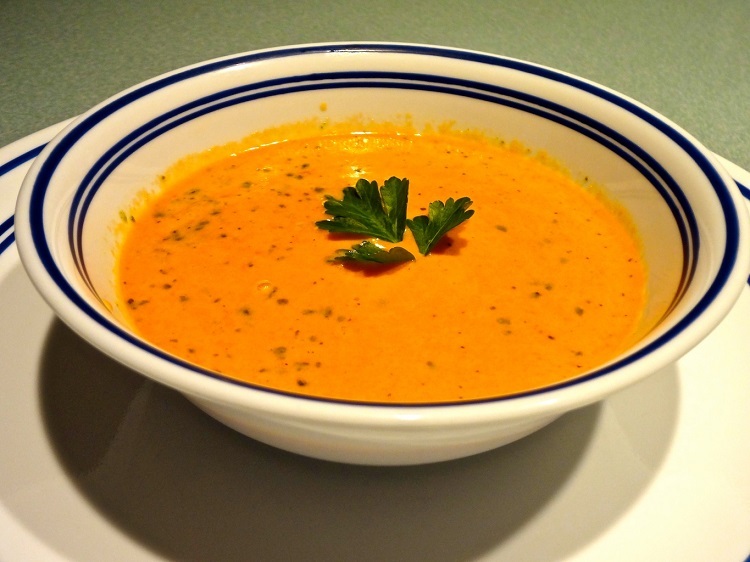 I am sure the tomatoes are the reason this soup was just so delicious, though the cream and the company added a lot to the recipe. I hope you try this Easy and Delicious Homemade Tomato Soup if you haven’t already, and please, share any quick-fix meals you may have that maximize taste and minimize fuss. My gosh, this soups delicious – I will have to try it. Thanks! Looks beautiful. I can tell you love to cook, Ann. Very festive and sounds tasty. Wow, thanks for the delicious sounding recipe! That looks absolutely delicious and I -hate- tomato soup. I’m going to give this recipe a try. Thanks! Love this, think am going to prepare this for my hubby, he loves tomato soup. This looks so yummy. Thank you for the post. I love soup this time of year!! Warms the belly and heart! Ann, really like your idea of pesto. I generally add dried or frozen basil, but the pesto would add another dimension. You picture is so inviting…ready to get out a spooon. Sounds delicious, especially for the cold and windy day we’ve had here! Thanks for the yummy idea. Unfortunately I don’t have any tomatoes on hand, but I do have canned tomato soup. I’m off to go make that! Ann, your tomato soup sounds delicious. I think I’ll make that soup for dinner tomorrow with a chicken sandwich. Crock Pot Bean Soup 1 bag mixed beans, rinsed2 leeks, coheppd3 – 4 carrots, cut into coins4 – 5 stalks of celery, coheppdveggie broth or water and 2-3 bullion cubes1 tbsp Herbs de Provencegreens, coheppd. optionallemon, salt, and pepper to tasteHere’s how to make bean soup when you’re pressed for time. It takes about 15 – 20 minutes to prepare the night before, 5 minutes the morning of, and it’s pretty much ready to go when you’re back from work.The night before: To the crock pot, add the coheppd veggies and rinsed beans. Cover with water an inch over the veggies and beans. Store in the fridge.Morning of: Pour off the water from the beans and veggies. Fill with fresh water and bullion cubes or broth to bd inch over the beans. Add the Herbs de Provence. Plug in the crock pot and turn on low. Will need to cook for 10 hours on low. Less if you do a combination of low and high. Sounds and looks delicious! Like the swirl of pesto as a finishing touch! I want soup every day in autumn and winter and canned soups always taste horrible. I’ll keep this in mind. Sounds delicious and simple to make…A perfect combination in my book. My boyfriend hates tomatoes but like plain tomato soup with a grilled cheese. Weird right? This looks delicious. I love tomato soup. Especially with grilled cheese dunked in it 🙂 I was just ordering my garden seeds today and I am getting San Marzano tomato seeds. One of the best tomatos on the market. I’ve never made my own tomato soup. This sounds soo good, and I’d love to try it with San Marzano, too! Sounds like a great pairing for a grilled cheese sandwich! The Quick and Easy Homemade Tomato Soup recipe looks astounding. I cannot wait to taste your special recipe. I thank you so much for the directions on this delicious treat. I was excited to learn how to make it. The next day in class…what happens? She opens a can of tomato soup and heats it up and that was our lesson. I was shocked. That aint cooking! I just discovered the joy of making soup in the last year or so and I love trying new recipes as well as making “Stone Soup” from leftovers. Thanks for the recipe! This would be much better than canned soup. You know what ingredients are in it. I love when my home smells of soup! Homemade food is the best and this tomato soup is delicious, Pam! I love a good, homemade soup in the colder months. I love how easy this is and can’t wait to make it! Thanks for the recipe,tomato soup is great with grilled Cheese! What a fantastic idea! My father eats soup pretty often, and tomato soup (good ol’ Campbell’s is his go-to) is one of his favorites. I recently found a homemade ketchup recipe, and to make this recipe for him would make perfect sense. Thank you so much! Always wanted to learn how to make homemade tomato soup! Thanks for the inspiration! I’ve never had home made tomato soup. I imagine it’s delicious. This looks so good and so easy to make! Thanks so much. This is exactly what I’ve been looking for. I’m ready to graduate from canned tomato Soup. Merry Christmas. I love tomato soup, but I usually just eat Campbell’s out of a can. That looks and sounds really great. I imagine the basil pesto at the end just topped the whole thing off making it delicious! Next Time, Add a 1/3 cup of grated parmesan cheese. Delicious and a close copy of Panera Bread’s basil cheese tomato soup. Vegetable Stock is good too.